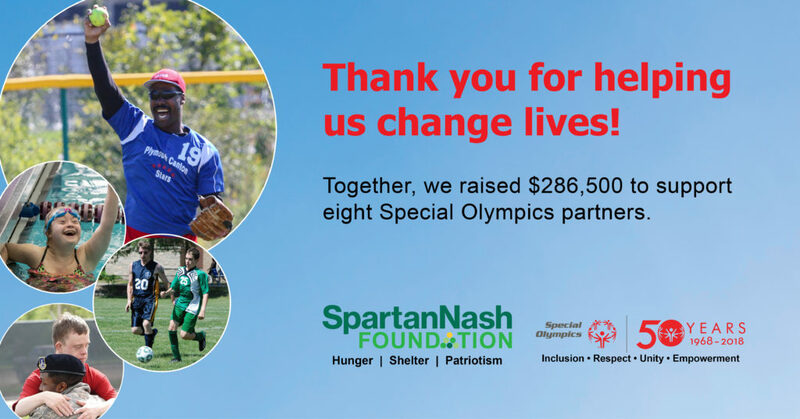 GRAND RAPIDS, Mich. – Together with its store guests and company associates, the SpartanNash Foundation’s Special Olympics scan campaign raised $286,500 on behalf of athletes and State Summer Games in Iowa, Michigan, Minnesota, Nebraska, North Dakota, Ohio, South Dakota and Wisconsin. Since 1985, SpartanNash and its charitable giving arm, the SpartanNash Foundation, have donated nearly $9.4 million and thousands of volunteer hours through its partnership with Special Olympics. SpartanNash has been the Presenting Sponsor of the Special Olympics Michigan Summer Games since 1985. The company has also supported Special Olympics Minnesota Summer Games since 2003. Between May 2 and 13, the SpartanNash Foundation hosted the companywide fundraising scan campaign in SpartanNash-owned stores throughout the Midwest, giving store guests the opportunity to donate $1, $5 or $10 at any checkout lane. In each state, SpartanNash stores – including Family Fare Supermarkets, D&W Fresh Market, VG’s Grocery, Dan’s Supermarket and Family Fresh Market – teamed up to support Special Olympics partners, resulting in the $286,500 total. One hundred percent of all funds raised during the annual Special Olympics scan campaign go directly to year-round sports training and athletic competition opportunities. SpartanNash underwrites the costs to run the scan campaign, contributes funding and encourages associates to volunteer during Special Olympics State Summer Games and beyond. $165,000 for Special Olympics Michigan. The check will be presented during the State Sumer Games opening ceremony, taking place on Thursday, May 31 at 6:15 p.m. at the Kelly/Shorts Stadium at Central Michigan University. For a complete list of stores participating in the companywide scan campaign and the eight Special Olympics affiliates they will support, visit spartannash.com/special-olympics. The Special Olympics retail scan campaign is the second of four fundraising campaigns the SpartanNash Foundation will conduct in 2018. To date, the SpartanNash Foundation has raised $463,200 on behalf of local Habitat for Humanity and Special Olympics partners in eight states. Upcoming retail scans will raise funds and awareness for patriotic partners (June 27-July 8) and community food pantries (Oct. 24-Nov. 4). In 2018, SpartanNash recognized Healthy Athletes in Michigan and Minnesota. Kayla Cornell and Devin Johnson helped promote the Foundation’s retail scan with in-store autograph sessions – and were featured on the packaging of bottles of Our Family® brand water. Nearly 300,000 cases of the specially designed 24-pack bottles of spring water were for sale on store shelves at more than 140 SpartanNash-owned stores and independent retail locations throughout the country. SpartanNash (Nasdaq: SPTN) is a Fortune 350 company whose core businesses include distributing grocery products to independent grocery retailers, national accounts, its corporate-owned retail stores and U.S. military commissaries and exchanges. SpartanNash serves customer locations in all 50 states and the District of Columbia, Europe, Cuba, Puerto Rico, Italy, Bahrain, Djibouti and Egypt. SpartanNash currently operates 142 supermarkets, primarily under the banners of Family Fare Supermarkets, D&W Fresh Market, VG’s Grocery, Dan’s Supermarket and Family Fresh Market. Through its MDV military division, SpartanNash is a leading distributor of grocery products to U.S. military commissaries.